As late as 1982 Soviet musicologists claiming any significance for Nikolay Roslavets were vigorously suppressed. Only in 1990 was his unmarked grave identified. How many scores were lost when his flat was ransacked just after his death in 1944? The ruthless vengeance of a reactionary proletariat—branding Roslavets, himself born of peasant stock and a fervent 1917 revolutionary, a mere pedlar of bourgeois ‘art for art’s sake’—has fortunately now given way to a gradual recognition of the very real significance of this ‘Russian Schoenberg’. Hyperion has played an important part in the composer’s contemporary rehabilitation, with a benchmark recording of some orchestral works performed by Ilan Volkov and the BBC Scottish Symphony Orchestra. The same performers are joined here by the brilliant young violinist Alina Ibragimova. Roslavets’s Violin Concerto No 1 was thought to exist only in piano reduction form until 1989 when the full score was unearthed in the archives of the State Music Publishers in Moscow. It is an ambitious work, laid out on a large scale. Roslavets’s mastery of a leaner symphonic idiom, virtuosic and elegant, is immediately apparent. It ranks as one of the most important Russian works of its era. Violin Concerto No 2 was completed in 1936, and was written shortly after the composer’s remarkable Chamber Symphony of 1934–5 (recorded on Hyperion CDA67484). Thus it belongs to the period following Roslavets’s return to Moscow from Uzbekistan, when he seems to have been trying to re-establish his reputation as a composer of substantial works, but after the notorious Pravda denunciations of Shostakovich and musical modernism in January 1936 he probably felt it stood little chance of performance. Since then it has remained in total obscurity until very recently, and these notes were heard for the first time in Glasgow’s City Hall in January 2008—the performance on the present disc is in fact the world premiere. Nikolay Andreyevitch Roslavets has emerged as one of the most fascinating figures in Russian music in the first half of the twentieth century. Unlike most of his composer contemporaries in the early Soviet period, he genuinely came from a peasant background. In autobiographical jottings dating from 1924, he described his birthplace—Dushatino in the Ukraine, where he first drew breath on 4 January 1881 (Old Style 23 December 1880)—as ‘a godforsaken, half-Ukrainian, half-Byelorussian hole’. At first self-taught, Roslavets began to study music during the 1890s by attending classes in Kursk, the nearest large city, and was eventually accepted as a student at the Moscow Conservatory, where he studied violin as well as composition under Sergei Vassilenko and Mikhail Ippolitov-Ivanov. He graduated in 1912, gaining the Grand Silver Medal for his cantata Heaven and Earth, inspired by Lord Byron’s poetic drama. Even this early Roslavets was associated, along with Alexander Mossolov and Vincent Lourié, with Russia’s artistic avant-garde. He engaged in the vigorous artistic debates occasioned by Futurism, Symbolism and other new ideas, and was close to visual artists such as Malevich. Roslavets welcomed the revolutions of 1917 and after the Bolshevik Revolution in October he was made director of Kharkov Conservatory, remaining until 1924, when he returned to Moscow and took up a position in the State Publishing House. Describing himself as ‘extreme left-wing’ and ‘an intellectually creative proletarian’, Roslavets directed its Political Department, edited the journal Muzykalnaya Kultura, and was one of the leaders (with his contemporary and friend Nikolay Miaskovsky) of the most progressive of the various new musical bodies competing for attention in the USSR, the Association for Contemporary Music. His colleagues included Miaskovsky, Mossolov, Popov and Shostakovich. The tenth anniversary of the October Revolution was celebrated in 1927 with a concert featuring the premiere of Roslavets’s cantata October in the same programme as that of Shostakovich’s Symphony No 2, ‘Dedication to October’, and Mossolov’s Iron Foundry. Nevertheless Roslavets was a committed modernist. The direction of his artistic sympathies is apparent from his support for performances of music by the Second Viennese School and his authorship of articles including one entitled ‘On pseudo-proletarian music’. For several years already his works had been under attack from the adherents of ‘proletarian music’, especially members of the RAPM (the Russian Association of Proletarian Musicians), who claimed them as counter-revolutionary and bourgeois art for art’s sake. The endless political warfare sapped Roslavets’s strength. In 1929 he was denounced as an ‘enemy of the People’ and in 1930 was forced to publicly repent of his former artistic convictions. He spent some years in Tashkent, Uzbekistan, as musical adviser of the Opera and Ballet Theatre. However he returned to Moscow in 1933 where he lectured at the Polytechnic Institute and was later required to train military band leaders. He made a living out of this and other comparatively menial tasks until he was finally admitted to the Composers’ Union in 1940. He suffered a severe stroke in the same year and was semi-invalid until his death from a second stroke in 1944. Immediately after his death his flat was ransacked by a group of former ‘proletarian musicians’ who confiscated many manuscripts, though others were saved by his widow. For thirty years afterwards Roslavets’s name, expunged from the music dictionaries, was hardly mentioned in Soviet musical literature. In the wake of perestroika, however, Roslavets was among the creative figures who were substantially rehabilitated. His grave in the Vagankovo Cemetery, which had remained unmarked, was identified in 1990, and many of his compositions have now been revived, published and recorded. While still a student Roslavets was already producing music that was very daring for its time and place (see for example In the hours of the New Moon, recorded on Hyperion CDA67484). Deeply influenced by the later works of Scriabin, his harmonic idiom tended towards extreme chromaticism. His quest for a personal language began in 1909 and led in 1913 to his propounding a new harmonic system based on ‘synthetic chords’ that contain both the horizontal and vertical sound-material for a work (a concept close to that of Schoenberg’s early serialism). These principles are enshrined in the remarkable sets of Études, Poems, Preludes and Compositions for solo piano that he composed during the immediately pre-Revolutionary years. (A selection of these have been recorded by Marc-André Hamelin on Hyperion CDA66926.) After his fall from grace, while in Tashkent, he turned for a while to working with folk material, producing among other works the first Uzbek ballet, Pachta (‘Cotton’). The works of his last years in Moscow show a simplification of his characteristic language to admit a more classical conception of tonality, but are still individual in orientation, such as the late cycle of 24 Preludes for violin and piano (1941–2). Roslavets composed his Violin Concerto No 1 in 1925 while he was working as an editor for the State Publishing House. It was published two years later in a reduction for violin and piano, which was first performed in Moscow, on 29 May 1929, by P Ilchenko and P Nykitin at a concert sponsored by the Association for Contemporary Music. It was not heard again in Roslavets’s lifetime, and after his death the full score was believed to have been lost—if indeed it had existed at all, for all that could be found were sketches and Roslavets in his own catalogue of his music had listed the reduction only. As a result, in the last decades of the Soviet Union the reduction was occasionally played, and was even performed at IRCAM in Paris in October 1979. The composer Edison Denisov, who was in the forefront of the re-awakening interest in Roslavets’s compositions and regarded this Violin Concerto as the finest twentieth-century concerto after Alban Berg’s, planned to make an orchestral score of his own on the basis of the reduction. Fortunately, before he had carried out his intention, Roslavets’s full score was unearthed in the archives of the State Music Publishers in Moscow. As a result, it was one of the first works of the ‘Roslavets revival’ to be brought before the public, on 19 November 1989, performed by Tatiana Grindenko and the Moscow Philharmonic Orchestra under Feodor Gluschenko; Grindenko later gave many performances in and outside Russia. The Concerto is an ambitious work (Roslavets uses a large orchestra with triple woodwind, full brass section and percussion, as well as a harp and a piano), laid out on a large scale. It develops the technique of ‘synthetic’ (or ‘thematic’) chords that Roslavets had initially developed from his understanding of the late works of Scriabin and perfected in his piano and chamber works of the immediately preceding years. There are still traces of his earlier Scriabinesque style, but Roslavets’s mastery of a leaner symphonic idiom, virtuosic and elegant, is immediately apparent. His harmonic and melodic innovations are here set within a relatively traditional three-movement form, with an energetic first movement and finale enclosing a central slow movement that is linked to the first movement by a solo cadenza. Roslavets’s personal applications of principles akin to the Schoenbergian twelve-note method are apparent at the outset, where pizzicato cellos and basses repeat a figure comprising six notes of the chromatic scale and are answered by the violins with a repeated ascending figure using the other six. This foreshadows many situations throughout the concerto where the orchestra confines itself to one set of pitches and the violin uses another, the combination of the two spanning the total chromatic scale. The opening of the Allegretto grazioso first movement, with its pizzicato bass ostinato, has a mechanistic character, but as soon as the violin has soared up to the heights in its first entry we are transported to an ecstatic sound-world more reminiscent of Scriabin or Szymanowski. The pull between taut, regular rhythms and ecstatic languor creates an unusual polarity that is central to the work. A more polyphonic Più mosso section, formally a second subject, is introduced by tenebrous chromatic writing in piano and low strings, rises to a climax and then sinks to the depths before the violin is heard again, in dialogue with a few instruments. The tempo shifts to a scherzo-like Allegro vivace for a swift-moving development which works up the material so far heard and then gives the violin, grazioso e capriccioso, the most lyrically diatonic music so far heard, though spun above a form of the opening bass ostinato. That ostinato then returns in its original shape, transposed, to signal the start of the recapitulation. Soon the violin is soaring above the orchestra in passionate octaves that Roslavets marks entusiastico. After a giocoso episode of almost continuous violin figuration the piano-dominated Più mosso returns. Once again it sinks down into the depths, but then the orchestral texture opens out upwards into a radiant, wide-spread chord from which the violinist launches a brilliantly convoluted ‘Quasi cadenza’ in free tempo, an elegant and eloquent bravura outpouring full of double- and quadruple-stopping, free polyphony, roulades and trills that connects directly into the slow movement. This is a large-scale Adagio sostenuto beginning with wintry tremolandi in the strings and melancholic wind solos (the five-note clarinet figure heard right at the beginning remains a thematic focus for much of what ensues). The violin rhapsodizes against insistently repeated motivic figures passed from instrument to instrument. The intensity, supercharged harmony and polyphonic density, soon issuing in an orchestral climax, make very clear why some of his compatriots regarded Roslavets as a Russian Schoenberg—though it is Schoenberg’s early works that are most obviously paralleled in this music. Like some of Roslavets’s other slow movements the form is exploratory, constantly evolving: almost like a tone-poem with obbligato violin. A faster-moving con moto pits the violin mainly against solo woodwind, despite fuller con passione outbursts. After a lyric duet between violin and harp the music returns to the Adagio tempo for a radiantly romantic orchestral tutti marked molto tranquillo, to which the violin responds in more skittish, fantastic style. All the materials so far heard return in varied forms and different instrumental colourings. (One is constantly aware that in the Concerto’s reduction for violin and piano it would simply be impossible to grasp Roslavets’s sheer mastery of orchestral timbres.) In the delicate coda, harp and solo strings spell out a wide-spread ten-note chord, against which the violin descends, like a sigh, to its lowest G.
The finale (Allegro moderato, risoluto) is a movement of insistent rhythms, hunted and haunted but with an exciting onward drive. The main theme, announced by the violin, is a vaunting, fanfare-like idea driven by insistent dotted rhythms. A more lyrical theme, espressivo, is heard against triplet figurations in horns and trumpets. These two ideas alternate in headlong juxtaposition. A more chromatic third idea in the violin is soon swept aside by the return of the dotted rhythms, con agitazione, which precipitates an emotional climax with the violin struggling to be heard against the power of the full orchestra. Over a bass drum roll, the chase is resumed, in fresh instrumental colours. It is the dotted-rhythm idea which dominates to the end, con fuoco, the fanfare character becoming a real fanfare for trumpets before the convulsive final chords. While the Violin Concerto No 1 was among the first works to help re-establish Roslavets’s reputation, for a long time the very existence of a second concerto was a matter of speculation; the score is a comparatively recent rediscovery. The Violin Concerto No 2 was completed in 1936, and was therefore written shortly after his remarkable Chamber Symphony of 1934–5 (recorded on Hyperion CDA67484). Thus it belongs to the period following Roslavets’s return to Moscow from Uzbekistan, when he seems to have been trying to re-establish his reputation as a composer of substantial works, but after the notorious Pravda denunciations of Shostakovich and musical modernism in January 1936 he probably felt it stood little chance of performance. The performance on the present disc is in fact the world premiere. While Roslavets’s first violin concerto must rank among the most important Russian works of its era, the second concerto seems in some respects a slighter piece. It uses the same three-movement form, but is altogether shorter (the second and third movements are quite brief), and calls for a somewhat smaller orchestra. Compared to Concerto No 1 it is written—like the last two movements of the Chamber Symphony—in a harmonically simplified, more strongly tonal style, with a clear tonal centre of D major. Its forms are rather laconic: there is less development of material, but underlying its major-key pretensions there is a persistent darker undertow characteristic of the earlier Roslavets. It seems almost certain, moreover, that in the second concerto (as in the Scherzo of the Chamber Symphony) Roslavets evokes Uzbek, or at least Central Asian, folk melodies, whether quoted or imitated. Unquestionably the opening theme of the first movement has that character, and (after the interposition of a dotted-rhythm figure apt for development) is given almost technicolour treatment before the initial tutti dies away. The violin’s striking, recitative-like first entry, accompanied by timpani roll and harp glissandi, proceeds to a florid decoration of a lyrical second theme: this is repeated and elaborated and leads into a faster development in which the violin presently takes over the opening theme but seems more intent on giving out fragments in harmonics and decorative elements. Indeed one fascination of this movement is the comparative simplicity of its melodic materials set against the convolution and bravura of the solo violin writing. The bold recitative returns, but this time leads into a sprightly Vivo coda. The Adagio slow movement is in a comparatively simple ternary form. It begins in F with a substantial orchestral introduction in which an initial folk-like theme soon becomes only one strand in orchestral polyphony. The violin then takes it up, again in much-decorated form. A contrasting theme appears in A minor, at the same tempo, to form the central section, and a short unaccompanied solo leads into an elaborated version of the opening section, with a brief coda in which the violin eventually soars up to end on a high F. Throughout, the mood is elegiac and oppressed, but richly harmonized. The finale, Allegro giocoso, starts off with a cheerful main theme whose chief motif is a triadic idea of two-note figures leaping up and down in thirds. As this figure gravitates to the bass the tonality changes to F sharp minor and the violin, accompanied by harp and clarinets, gives out a long-breathed espressivo theme closely related to the folksong-like melody with which the concerto began. A mysterious transition works back to the ebullient idea that opened the finale after which a second episode, in E flat, evolves with another folk-like dolce theme—into which the giocoso theme intrudes, and then hustles all before it into a breakneck coda. Brilliantly effective though they are, both this finale and the slow movement feel rather vestigial, as if Roslavets was unwilling to explore the full expressive potential of his materials. Or perhaps he intended a comment on a time that demanded optimism and had no time for reflection. Whatever the reason, this concerto remains a superb vehicle for the solo violin, and has certainly not deserved the obscurity that has so far been its fate. Nikolaï Andreïevitch Roslavets fut l’une des plus fascinantes figures de la musique russe de la première moitié du XXe siècle. Contrairement à la plupart de ses confrères de l’ère soviétique naissante, il venait d’un authentique milieu paysan—dans ses notes autobiographiques de 1924, il décrira Douchatino, le village d’Ukraine où il poussa son premier cri le 4 janvier 1881 (vieux style 23 décembre 1880), comme «un trou paumé, moitié ukrainien moitié biélorusse». D’abord autodidacte, il commença sa formation musicale dans les années 1890 à Koursk, la grande ville la plus proche, avant de finalement intégrer le Conservatoire de Moscou, où il étudia le violon et la composition avec Sergueï Vassilenko et Mikhail Ippolytov-Ivanov. Diplômé en 1912, il remporta la Grande médaille d’argent avec sa cantate Le ciel et la terre, inspirée du drame poétique de Lord Byron. Ce Roslavets-là était déjà lié à l’avant-garde artistique russe, aux côtés d’Alexandre Mossolov et de Vincent Lourié. Il prit part aux vifs débats soulevés par les idées nouvelles, tels le futurisme et le symbolisme, en fut proche de plasticiens comme Malevitch. Roslavets salua les révolutions de 1917; après la Révolution bolchevique d’Octobre, il fut nommé directeur du conservatoire de Kharkov et le resta jusqu’en 1924, date de son retour à Moscou où l’attendait un poste aux Éditions d’État. Se décrivant lui-même comme un «prolétaire d’extrême-gauche, intellectuellement créatif», il prit la tête du département politique, dirigea la rédaction du journal Mouzykalnaïa kultura et fut parmi les chefs de file (avec son ami Nikolaï Miaskovski) de l’Association pour la musique contemporaine, le plus progressiste des nouveaux organismes musicaux alors rivaux en URSS. Il eut notamment pour collègues Miaskovski, Mossolov, Popov et Chostakovitch. En 1927, le dixième anniversaire de la Révolution d’Octobre fut célébré par un concert où furent créées sa cantate Octobre, la Symphonie no 2 («dédiée à Octobre») de Chostakovitch et Fonderie d’acier de Mossolov. Roslavets n’en fut pas moins un moderniste convaincu. L’orientation de ses sympathies artistiques transparaît bien dans le soutien qu’il apporta aux exécutions d’œuvres de la seconde École viennoise et dans les articles qu’il signa, dont un intitulé «De la musique pseudo-prolétarienne». Depuis plusieurs années déjà, ses compositions étaient attaquées par les tenants d’une «musique prolétarienne», surtout les membres de l’ARMP (Association russe des musiciens prolétariens), qui les jugeaient contre-révolutionnaires, ressortissant à l’art pour l’art bourgeois. Ces interminables querelles politiques sapèrent ses forces. Dénoncé comme «ennemi du Peuple» en 1929, il fut contraint, en 1930, de se repentir publiquement de ses anciennes convictions artistiques. Il passa quelques années à Tachkent, comme conseiller musical de Théâtre de l’Opéra et du Ballet. En 1933, cependant, il rentra à Moscou, où il enseigna à l’Institut polytechnique avant d’être appelé à former des chefs de fanfare militaire. Il vécut de cette fonction, et d’autres tâches relativement ingrates, jusqu’à ce qu’on l’admît enfin à l’Union des compositeurs, en 1940. Mais cette année-là, une grave attaque d’apoplexie le laissa à demi invalide—il mourra en 1944, des suites d’une seconde attaque. Juste après sa mort, son appartement fut saccagé par un groupe d’anciens «musiciens prolétariens» qui confisquèrent nombre de ses manuscrits, même si sa veuve en sauva certains. Pendant trente ans, son nom, expurgé des dictionnaires, disparut presque de la littérature musicale soviétique mais fut de ceux qu’on réhabilita considérablement après la perestroïka. Sa tombe, qui était restée sans nom au cimetière de Vagankovo, fut identifiée en 1990, et quantité de ses œuvres sont aujourd’hui ressuscitées, publiées et enregistrées. Encore étudiant, Roslavets produisit une musique déjà très osée pour l’époque et le lieu (ainsi Aux heures de la nouvelle lune, enregistrée sur le disque Hyperion CDA67484). Profondément influencé par le Scriabine dernière manière, son langage harmonique tendit vers un chromatisme extrême. Sa quête d’un vocabulaire personnel, entamée en 1909, l’amena à concevoir un nouveau système harmonique fondé sur des «accords synthétiques» contenant le matériel sonore horizontal et vertical d’une œuvre (un concept proche du premier sérialisme schoenbergien). Ces principes font partie intégrante des remarquables corpus d’Études, de Poèmes, de Préludes et de Compositions pour piano solo qu’il écrivit dans les années prérévolutionnaires (Marc-André Hamelin en a enregistré une sélection sur le disque Hyperion CDA66926). Une fois tombé en disgrâce, à Tachkent, il travailla un temps avec du matériel folklorique, produisant notamment le premier ballet ouzbek, Pachta («Coton»). Les partitions de se dernières années moscovites révèlent une simplification de son langage singulier pour intégrer une conception de la tonalité plus classique, mais toujours avec une orientation personnelle, comme dans le tardif cycle des vingt-quatre Préludes pour violon et piano (1941–2). 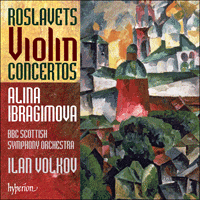 Roslavets composa son Concerto pour violon no 1 en 1925, alors qu’il était rédacteur aux Éditions d’État. Deux ans plus tard parut une réduction pour violon et piano, qui fut créée le 29 mai 1929 à Moscou par P. Ilchenko et P. Nykitin, lors d’un concert parrainé par l’Association pour la musique contemporaine. Elle ne fut jamais rejouée du vivant de Roslavets et, après la mort de celui-ci, on en crut la grande partition perdue—d’aucuns doutèrent même de son existence, car on n’en trouvait que des esquisses et, dans le catalogue de ses œuvres, le compositeur en avait seulement répertorié la réduction. En conséquence de quoi, dans les dernières décennies de l’Union soviétique, seule cette réduction fut jouée de temps à autre—elle fut même exécutée à l’IRCAM de Paris, en octobre 1979. Le compositeur Edison Denisov, qui fut pour beaucoup dans le regain d’intérêt pour la musique de Roslavets et qui voyait en cette pièce le meilleur Concerto pour violon du XXe siècle après celui d’Alban Berg, envisagea de tirer une partition orchestrale de la réduction. Par bonheur, avant qu’il eût mis son projet à exécution, la grande partition de Roslavets fut exhumée des archives des Éditions musicales d’État, à Moscou, devenant l’une des premières œuvres du «renouveau de Roslavets» à être portée à la connaissance du public: le 19 novembre 1989, Tatiana Grindenko (qui la rejouera souvent, en Russie et ailleurs) l’interpréta avec l’Orchestre philharmonique de Moscou placé sous la baguette de Fyodor Gluschenko. Ce Concerto est une composition ambitieuse (Roslavets utilise un grand orchestre avec triples bois, cuivres au complet, percussion, mais aussi harpe et piano), à grande échelle. Roslavets y développe la technique des accords «synthétiques» (ou «thématiques»), qu’il avait élaborée à partir de sa compréhension du Scriabine tardif puis perfectionnée dans ses œuvres pianistiques et dans sa musique de chambre immédiatement antérieures. Toutes les traces de son premier style scriabinesque n’ont pas encore disparu, mais sa maîtrise d’un idiome symphonique raréfié, virtuose et élégant, est d’emblée patente. Ses innovations harmonico-mélodiques sont ici intégrées dans une forme tripartite relativement traditionnelle, avec un premier mouvement et un finale énergiques flanquant un mouvement lent central amené par une cadenza solo. L’usage personnel que Roslavets fait des principes apparentés au dodécaphonisme schoenbergien transparaît dès le début, quand les violoncelles et les contrebasses en pizzicato répètent une figure comprenant six des notes de la gamme chromatique, à laquelle les violons répondent par une figure ascendante répétée réunissant les six autres notes. Ce qui préfigure de nombreuses situations tout au long du concerto, où l’orchestre se cantonne à une série de hauteurs de son, tandis que le violon en emploie une autre, la combinaison des deux couvrant la totalité de la gamme chromatique. Avec son ostinato à la basse, en pizzicato, l’ouverture du premier mouvement Allegretto grazioso a un côté mécanique mais, à peine le violon parvient-il au summum, à sa première entrée, que nous voilà transportés dans un univers sonore extatique, plus proche de Scriabine ou de Szymanowski. L’attraction entre les rythmes tendus, réguliers, et la langueur extatique crée une polarité inhabituelle mais fondatrice. Une section Più mosso davantage polyphonique—formellement, un second sujet—est introduite par une ténébreuse écriture chromatique au piano et aux cordes graves; elle gagne un apogée puis sombre dans les tréfonds avant que le violon ne revienne dialoguer avec quelques instruments. Le tempo passe à un Allegro vivace de type scherzo pour un développement véloce qui étoffe le matériau entendu jusqu’alors, avant de confier au violon, grazioso e capriccioso, la musique la plus lyriquement diatonique qui soit, pourtant filée par-dessus un avatar de l’ostinato à la basse initial. Cet ostinato revient ensuite sous sa forme originale, mais transposée, pour signifier le début de la réexposition. Bientôt, le violon s’élève au-dessus de l’orchestre en octaves ferventes que Roslavets marque entusiastico. Après un épisode giocoso d’une figuration violonistique presque continue, le Più mosso dominé par le piano revient. De nouveau, il sombre dans les tréfonds, mais la texture orchestrale s’épanouit alors vers le haut en un accord radieux, éployé, d’où le violoniste lance une «Quasi cadenza» brillamment convolutée, en tempo libre—un épanchement de bravoure éloquent et élégant (avec force doubles et quadruples cordes mêlées de polyphonie libre, de roulades et de trilles), directement rattaché au mouvement lent. C’est un Adagio sostenuto d’envergure, qui s’ouvre sur des tremolandi glacials, aux cordes, et sur de mélancoliques solos des vents (la figure de cinq notes entendue à la clarinette, au tout début, demeure un centre thématique pour l’essentiel de ce qui suit). Le violon s’extasie sur fond de figures motiviques répétées avec insistance, passées d’instrument en instrument. L’intensité, l’harmonie surchargée et la densité polyphonique, aboutissant bientôt à un apogée orchestral, expliquent fort bien pourquoi ses compatriotes voyaient parfois en Roslavets un Schoenberg russe—même si, ici, le parallèle est surtout évident avec les premières œuvres schoenbergiennes. Comme dans certains autres mouvements lents de Roslavets, la forme est exploratoire, en constante évolution—presque un poème symphonique avec violon obligé. Un con moto plus véloce dresse le violon principalement contre un bois solo, malgré des effusions con passione plus denses. Passé un lyrique duo violon/harpe, la musique retrouve le tempo Adagio pour un tutti orchestral radieusement romantique marqué molto tranquillo, auquel le violon répond dans un style plus espiègle, plus fantastique. Tous les matériels entendus jusqu’alors reviennent sous des formes variées et des couleurs instrumentales différentes. (On sent que la réduction pour violon et piano ne permettrait tout bonnement jamais d’appréhender cette absolue maîtrise ses timbres orchestraux.) Dans la délicate coda, harpe et cordes solo déploient un accord de dix notes, contre lequel le violon descend, tel un soupir, jusqu’à son sol le plus grave. Le finale (Allegro moderato, risoluto) est un mouvement aux rythmes pressants, traqué et hagard, mais à l’allant palpitant. Le thème principal, annoncé au violon, est une idée outrecuidante, façon fanfare, mue par d’insistants, rythmes pointés. Un thème davantage lyrique, espressivo, se fait entendre sur fond de figurations en triolets, aux cors et aux trompettes. Ces deux idées alternent dans une juxtaposition impétueuse. Une troisième idée plus chromatique, au violon, est bientôt balayée par le retour des rythmes pointés, con agitazione, qui précipite un apogée émotionnel, le violon luttant pour se faire entendre face à la puissance du grand orchestre. Par-dessus un roulement de grosse caisse, la chasse reprend, dans de nouvelles couleurs instrumentales. C’est l’idée en rythmes pointés qui domine jusqu’au bout, con fuoco, le caractère de fanfare se faisant vraie fanfare pour trompettes avant les convulsifs accords finals. Si le Concerto pour violon no 1 fut parmi les premières œuvres qui contribuèrent à restaurer la réputation de Roslavets, l’existence même d’un second concerto releva longtemps de la conjecture—sa partition fut redécouverte assez récemment. Achevé en 1936, un peu après la remarquable Symphonie de chambre (1934–5; enregistrée sur le disque Hyperion CDA67484), ce Concerto pour violon no 2 appartient à la période moscovite de Roslavets, qui était revenu d’Ouzbékistan. Il souhaitait, semble-t-il, se refaire une réputation de compositeur d’œuvres substantielles mais, après les notoires dénonciations dont Chostakovitch et le modernisme musical avaient été l’objet dans la Pravda, en janvier 1936, il jugea probablement très minces ses chances d’être joué. Le présent enregistrement est, en réalité, une première mondiale. Ce second concerto paraît, à certains égards, plus léger que le premier—lequel est l’une des plus importantes partitions russes de son temps. Il en reprend la forme tripartite mais est autrement court (les deuxième et troisième mouvements sont brévissimes), avec un orchestre quelque peu réduit. Comparé au Concerto no 1, il est écrit—tout comme les deux derniers mouvements de la Symphonie de chambre—dans un style harmoniquement simplifié, plus fortement tonal, avec un évident centre tonal de ré majeur. Ses formes sont assez laconiques: le développement du matériel est moindre mais un reflux persistant, plus sombre, typique du Roslavets première manière, sous-tend ses prétentions en majeur. Par ailleurs, on peut presque affirmer que, dans ce second concerto (comme dans le Scherzo de la Symphonie de chambre), Roslavets évoque les mélodies folkloriques d’Ouzbékistan, ou du moins d’Asie centrale, que ce soit par des citations ou par des imitations. Incontestablement, le thème initial du premier mouvement est de cette veine-là et, après l’interposition d’une figure en rythme pointé adapté au développement, il est traité en quasi-technicolor avant que le tutti inaugural ne se meure. La saisissante première entrée du violon, façon récitatif, est accompagnée de roulements de timbales et de glissandi à la harpe, et avance jusqu’à une décoration fleurie d’un second thème lyrique: répété et étoffé, il mène à un développement plus rapide, dans lequel le violon reprend bientôt le thème initial tout en semblant davantage vouloir énoncer des fragments dans les harmoniques comme dans certains éléments décoratifs. Car ce mouvement fascine surtout par la relative simplicité de ses matériels mélodiques, qui tranche avec les circonvolutions et la bravoure de l’écriture violonistique solo. L’audacieux récitatif revient mais, cette fois, c’est pour déboucher sur une coda Vivo primesautière. Le mouvement lent Adagio affecte une forme ternaire relativement simple. Il s’ouvre en fa sur une substantielle introduction orchestrale dans laquelle un premier thème, dans le style d’un chant populaire, n’est bientôt plus qu’un fil dans la polyphonie orchestrale. Puis le violon le reprend, de nouveau sous une forme très ornée. Un thème contrastif apparaît en la mineur, au même tempo, pour constituer la section centrale, et un court solo non accompagné mène à une version élaborée de la section d’ouverture, avec une brève coda où le violon finit par atteindre un fa aigu. Le climat ne laisse pas d’être élégiaque et accablé, mais richement harmonisé. Le finale, Allegro giocoso, part sur un enjoué thème principal, dont le motif essentiel est une idée triadique, avec des figures de deux notes bondissant sans cesse en tierces. Alors que cette idée gravite vers la basse, la tonalité passe à fa dièse mineur et le violon, accompagné par la harpe et les clarinettes, énonce un thème espressivo au long souffle, étroitement affilié à la mélodie initiale, en style de chant populaire. Une mystérieuse transition ramène à la bouillonnante idée liminaire du finale, après quoi un second épisode, en mi bémol, se développe avec un autre thème dolce en style de chant populaire—dans lequel le thème giocoso s’immisce, avant de tout balayer sur son passage pour atteindre une coda à se rompre le cou. Pour brillamment efficaces qu’ils soient, ce finale et le mouvement lent paraissent plutôt atrophiés, comme si Roslavets avait rechigné à explorer tout le potentiel expressif de ses matériels. À moins qu’il n’ait voulu commenter une époque qui exigeait de l’optimisme, où il n’y avait pas de temps pour la réflexion. Reste que ce concerto est un splendide véhicule pour le violon solo et qu’il n’a certainement pas mérité de subir pareille éclipse. Nikolaj Andrejewitsch Roslawez ist als eine der faszinierendsten Gestalten in der russischen Musik der ersten Hälfte des 20. Jahrhunderts hervorgetreten. Anders als die meisten seiner Komponisten-Zeitgenossen der frühen sowjetischen Periode stammte er tatsächlich von einem bäuerlichen Hintergrund. In autobiographischen Skizzen von 1924 beschrieb er seinen Geburtsort Duschatino in der Ukraine, wo er am 4. Januar 1881 (oder 23. Dezember 1880 nach dem alten Kalender) das Licht der Welt erblickte, als „ein gottverlassenes, halb ukrainisches, halb weißrussisches Nest“. Roslawez studierte zuerst autodidaktisch Musik, besuchte dann in den 1890er Jahren Klassen in Kursk, der nächsten größeren Stadt, und wurde schließlich als Schüler am Moskauer Konservatorium aufgenommen, wo er Violine und Komposition bei Sergei Wassilenko und Michail Ippolitow-Iwanow studierte. Er graduierte 1912 und gewann die Silbermedaille für seine von Byrons poetischem Drama inspirierte Kantate Himmel und Erde. Selbst so früh schon war Roslawez neben Alexander Mossolow und Vincent Lourié mit Russlands neuer Avantgarde assoziiert. Er nahm an den lebhaften vom Futurismus, Symbolismus und anderen neuen Ideen angeregten künstlerischen Debatten teil und stand bildenden Künstlern wie Malewitsch nahe. Roslawez hieß die Revolutionen von 1917 willkommen, und nach der bolschewikischen Revolution im Oktober wurde er zum Direktor des Konservatoriums von Charkow ernannt, wo er bis 1924 blieb, als er nach Moskau zurückkehrte und eine Position im Staatlichen Musikverlag einnahm. Der nach seiner eigenen Beschreibung „extrem linke“ und „intellektuell kreative Proletarier“ Roslawez leitete die Politische Abteilung des Verlags, gab die Zeitschrift Muzykalnaya Kultura heraus und war (zusammen mit seinem Zeitgenossen und Freund Nikolaj Mjaskowski) einer der Leiter der progressivsten unter den verschiedenen neuen musikalischen Organisationen, die in der UdSSR um Aufmerksamkeit heischten: der Assoziation zeitgenössischer Musik. Zu seinen Kollegen gehörten Mjaskowski, Mossolow, Popow und Schostakowitsch. Der Zehnte Jahrestag der Oktoberrevolution wurde 1927 mit einem Konzert gefeiert, das die Uraufführung von Roslawez’ Kantate Oktober im gleichen Programm mit Schostakowitschs Symphonie Nr.2 „An den Oktober“ und Mossolows Die Eisengießerei erlebte. Aber Roslawez war dennoch ein engagierter Modernist. Die Ausrichtung seiner künstlerischen Sympathien wird durch seine Unterstützung von Aufführungen der Musik der Zweiten Wiener Schule und seine Autorschaft von Artikeln, darunter einem mit dem Titel „Über pseudoproletarische Musik“ offensichtlich. Seine Werke hatten schon mehrere Jahre lang unter dem Angriff der Anhänger der „proletarischen Musik“ gestanden, besonders den Mitgliedern des RAPM (Russischer Verband der proletarischen Musiker), die sie für gegenrevolutionär und spießbürgerliche Kunst um der Kunst willen hielten. Die endlose politische Kriegsführung laugte Roslawez aus. 1929 wurde als „Volksfeind“ denunziert und 1930 wurde er gezwungen, für seine früheren künstlerischen Überzeugungen öffentlich Buße zu tun. Er verbrachte einige Jahre in Taschkent in Usbekistan als Musikberater des Musiktheaters, kehrte aber 1933 nach Moskau zurück, wo er am Polytechnischen Institut Vorlesungen hielt und später Dirigenten von Militärkapellen trainieren musste. Er verdiente sich damit und mit anderen relativ niedrigen Aufgaben seinen Lebensunterhalt bis er 1940 endlich in den Komponistenverband aufgenommen wurde. Im gleichen Jahr erlitt er einen schweren Schlaganfall und war bis zu seinem Tode 1944 nach einem zweiten Schlaganfall Halbinvalide. Unmittelbar nach seinem Tode wurde seine Wohnung von einer Gruppe früherer „Proletarischer Musiker“ geplündert, die viele seiner Manuskripte beschlagnahmten, obwohl seine Witwe einige rettete. In den nächsten dreißig Jahren wurde Roslawez’ Name, der aus den Musiklexika gestrichen wurde, in der sowjetischen Musikliteratur kaum erwähnt. In der Folge der Perestroika gehörte Roslawez jedoch zu den kreativen Gestalten, die gründlich rehabilitiert wurden. Sein Grab im Wagankowo-Friedhof, das anonym geblieben war, wurde 1990 identifiziert; viele seiner Kompositionen wurden inzwischen wiederbelebt, veröffentlicht und aufgenommen. Bereits als Student produzierte Roslawez Musik, die für ihre Zeit und ihren Ort sehr gewagt war (man betrachte etwa In den Stunden des Neumonds, auf Hyperion CDA67484 eingespielt). Er war stark von Skrjabins späteren Werken beeinflusst, und sein harmonisches Idiom tendierte zu extremer Chromatik. Seine Suche nach einer persönlichen Musiksprache begann 1909 und führte 1913 dazu, dass er ein neues harmonisches System vorlegte, das auf „Synthetakkorden“ beruhte, die sowohl das horizontale sowie das vertikale Klangmaterial für ein Werk enthalten (ein Konzept, das Schönbergs früher Serialität nahe steht). Diese Prinzipien sind in den bemerkenswerten Heften von Etüden, Poemen, Präludien und Kompositionen für Soloklavier verankert, die er in den der Revolution unmittelbar vorhergehenden Jahren komponierte. (Eine Auswahl daraus wurde von Marc-André Hamelin auf Hyperion CDA66926 aufgenommen.) In Taschkent beschäftigte er sich, nachdem er in Ungnade gefallen war, eine Zeit lang mit der Arbeit mit Volksmaterial und produzierte das erste usbekische Ballett, Pachta („Baumwolle“). Die Werke aus seinen letzten Jahren in Moskau weisen eine Vereinfachung seiner charakteristischen Sprache auf, um ein klassischeres Konzept von Tonalität zu erlauben, behalten jedoch ihre individuelle Orientierung bei, wie etwa der späte Zyklus von 24 Präludien für Violine und Klavier. Roslawez komponierte sein Violinkonzert Nr. 1 1925, während er als Redakteur für den Staatlichen Musikverlag arbeitete. Es wurde zwei Jahre später im Klavierauszug veröffentlicht, und am 29. Mai 1929 in Moskau von P. Iltschenko und P. Nykitin in einem von der Assoziation zeitgenössischer Musik geförderten Konzert uraufgeführt. Es war zu Roslawez’ Lebzeiten nicht wieder zu hören, und nach seinem Tode wurde die Partitur, wenn sie überhaupt je existierte, für verloren gehalten, denn es waren nur Skizzen zu finden und in seinem eigenen Werkkatalog hatte Roslawez nur den Klavierauszug aufgeführt. In der Folge wurde in den letzten Jahrzehnten der Sowjetunion der Klavierauszug gelegentlich gespielt und sogar im Oktober 1979 bei der IRCAM in Paris aufgeführt. Der Komponist Edisson Denissow, der an der Vorfront des wiedererwachenden Interesses an Roslawez’ Kompositionen stand und dieses Violinkonzert als das schönste Violinkonzert des 20. Jahrhunderts betrachtete, hatte vor, seine eigene Orchesterpartitur anhand des Klavierauszugs anzufertigen. Glücklicherweise wurde Roslawez’ Partitur im Archiv des Staatlichen Musikverlags in Moskau entdeckt, bevor er seinen Plan ausführte. In der Folge war es eines der ersten Werke des „Roslawez-Revivals“, die der Öffentlichkeit vorgestellt wurden und wurde am 19. November 1989 von Tatiana Grindenko und den Moskauer Philharmonikern unter Fedor Gluschenko aufgeführt; Grindenko gab später viele Aufführungen in Russland und im Ausland. Das Konzert ist ein ambitiöses, groß angelegtes Werk (Roslawez verwendet ein großes Orchester mit dreifachen Holzbläsern und vollem Blech sowie Harfe und Klavier). Es entwickelt die Technik der „synthetischen“ (oder „thematischen Akkorde“), die Roslawez ursprünglich aus seinem Verständnis der späten Werke von Skrjabin entwickelt und in seinen Klavier- und Kammermusikwerken der unmittelbar vorhergehenden Jahre perfektioniert hatte. Es finden sich noch Spuren seines früheren skrjabinesken Stils, aber Roslawez’ Meisterung eines schlankeren, virtuosen und eleganten symphonischen Idioms tritt sofort deutlich zu Tage. Seine harmonischen und melodischen Neuerungen werden hier in eine relativ traditionelle dreisätzige Form gegossen, in der ein energischer erster Satz und Finale einen langsamen Mittelsatz umschließen, der durch eine Solokadenz mit dem ersten Satz verknüpft wird. Roslawez’ persönliche Anwendung von Prinzipien, die denen von Schönbergs Zwölftontechnik ähnlich sind, werden gleich am Anfang deutlich, wo Pizzicato-Celli und -Bässe eine Figur wiederholen, die aus sechs Tönen der chromatischen Tonleiter besteht und von den Violinen mit einer repetierten aufsteigenden Figur aus den anderen sechs beantwortet wird. Dies weist auf viele Situationen im Verlauf des Konzerts voraus, wo das Orchester sich auf eine Gruppe von Tonhöhen beschränkt und die Violine eine andere verwenden, die zusammen die ganze chromatische Tonleiter umfassen. Der Anfang des ersten Satzes, Allegretto grazioso, mit seinem Pizzicato Bass-Ostinato besitzt einen mechanischen Charakter, aber sobald die Violine sich mit ihrem ersten Einsatz in die Höhe geschwungen hat, werden wir in eine ekstatische Klangwelt entrückt, die eher an Skrjabin oder Szymanowski erinnert. Die Spannung zwischen straffen, regelmäßigen Rhythmen und ekstatischer Lässigkeit kreiert eine ungewöhnliche Polarität, die für das Werk wesentlich ist. Ein polyphonerer Più mosso-Abschnitt, formal ein zweites Thema, wird durch düster-chromatische Schreibweise im Klavier und den tiefen Streichern eingeführt, steigert sich zu einem Höhepunkt und sinkt wieder in die Tiefe, bevor die Violine, im Dialog mit nur wenigen Instrumenten, wieder zu hören ist. Das Tempo wechselt zu einem scherzohaften Allegro vivace für eine hurtige Durchführung, die das bisher gehörte Material verarbeitet und dann der Violine, grazioso e capriccioso, die am meisten lyrisch-diatonische Musik bis dahin gibt, obwohl sie über einer Form des einleitenden Bass-Ostinatos gesponnen wird. Dieses Ostinato erscheint dann, transponiert, in seiner Originalgestalt, um den Anfang der Reprise anzuzeigen. Die Violine schwebt bald wieder—in leidenschaftlichen Oktaven, die Roslawez mit entusiastico markiert -über dem Orchester. Nach einer Giocoso-Episode mit nahezu unablässiger Violinfiguration kehrt das vom Klavier dominierte Più mosso zurück. Es sinkt wiederum in die Tiefe, aber das Orchestergewebe weitet sich in einem strahlenden weitgefächerten Akkord nach oben aus, der ein Sprungbrett für eine brillant verwickelte „Quasi cadenza“ des Geigers in freiem Tempo bietet—ein eleganter, eloquenter, bravouröser Erguss voller Doppel- und Quadrupel-Griffe, freier Polyphonie, Läufen und Trillern, die direkt in den langsamen Satz überleitet. Dieser ist ein groß angelegtes Adagio sostenuto, das mit winterlichen Tremolandos in den Streichern und melancholischen Holzbläsersoli beginnt (die fünfnotige Klarinettenfigur, die ganz am Anfang zu hören ist, bleibt ein thematischer Kernpunkt für vieles, das folgt). Die Violine rhapsodiert gegen beharrlich wiederholte motivische Figuren, die von Instrument zu Instrument weitergereicht werden. Die Intensität, überladene Harmonik und polyphone Dichte, die bald zu einer orchestralen Steigerung führen, machen ganz deutlich, warum viele seiner Landsleute Roslawez als einen russischen Schönberg betrachteten—obwohl es Schönbergs frühe Werke sind, die ihre offensichtlichste Parallele in dieser Musik haben. Wie in einigen anderen langsamen Sätzen von Roslawez ist die Form explorativ, sich ständig entwickelnd, nahezu wie eine Tondichtung mit obligater Violine. Ein schnelleres con moto setzt die Violine vorwiegend gegen Soloholzbläser trotz vollerer con passione-Ausbrüche. Nach einem lyrischen Duett zwischen Violine und Harfe kehrt die Musik für ein molto tranquillo markiertes leuchtend romantisches Orchestertutti zum Adagio Tempo zurück; die Violine reagiert in launischerem, fantastischem Stil. Alles bislang gehörte Material kehrt in variierter Form und verschiedenen Instrumentalfärbungen wieder. (Man ist sich ständig bewusst, dass es im Klavierauszug des Konzerts mit Violine schlicht unmöglich gewesen wäre, Roslawez’ schiere Meisterschaft orchestraler Timbres zu erfassen.) In der delikaten Coda, artikulieren Harfe und Solostreicher einen weitgefächerten Zehnton-Akkord, gegen den die Violine, wie mit einem Seufzer zu ihrem tiefsten G absteigt. Das Finale (Allegro moderato, risoluto) ist ein Satz voll beharrlicher Rhythmen, gehetzt und spukhaft, aber mit aufregendem Impuls. Das Hauptthema, das von der Violine angekündigt wird, ist eine prahlerische, fanfarenhafte Idee, die von nachdrücklichen punktierten Rhythmen getrieben wird. Ein lyrischeres Thema, espressivo, ist gegen die Triolenfigurationen in Hörnern und Trompeten zu hören. Diese Ideen wechseln sich in eiliger Gegenüberstellung ab. Eine chromatischere dritte Idee in der Violine wird bald durch die Rückkehr der punktierten Rhythmen, con agitazione, beiseite gewischt; dies führt eine emotionale Steigerung herbei, in der die Violine sich anstrengen muss, um über die Macht des ganzen Orchesters gehört zu werden. Über einem Wirbel der Basstrommel wird die Jagd mit frischen Instrumentalfarben wieder aufgenommen. Die Figur der punktierten Rhythmen dominiert bis zum Ende, con fuoco, und der Fanfarencharakter verwandelt sich in eine echte Fanfare für Trompeten bevor das Werk mit zuckenden Akkorden schließt. Während das Violinkonzert Nr. 1 zu den ersten Werken gehörte, die halfen, Roslawez’ Ansehen wieder zu etablieren, blieb die Existenz eines zweiten Violinkonzerts Spekulation; die Partitur wurde erst vor relativ kurzer Zeit entdeckt. Das Violinkonzert Nr. 2 wurde 1936 vollendet, und wurde also kurz nach seiner bemerkenswerten Kammersymphonie von 1934–35 (auf Hyperion CDA67484) geschrieben. Daher gehört es zu der Periode nach Roslawez’ Rückkehr nach Moskau von Usbekistan, als er scheinbar seinen Ruf als Komponist substantieller Werke wieder etablieren wollte, aber nach den notorischen Prawda-Denunziationen von Schostakowisch und musikalischem Modernismus im Januar 1936 glaubte er wohl, dass es nur wenig Aussichten auf eine Aufführung haben würde. Die Aufführung auf der vorliegenden CD ist in der Tat die Uraufführung. Während Roslawez’ erstes Violinkonzert unter den bedeutendsten russischen Werken seiner Ära rangieren muss, schein das zweite in vieler Hinsicht ein leichteres Stück. Es verwendet die gleiche dreisätzige Form, ist aber insgesamt kürzer (der zweite und dritte Satz sind relativ kurz) und verlangt ein etwas kleineres Orchester. Im Vergleich zum Konzert Nr. 1 wurde es—wie die letzten beiden Sätze der Kammersymphonie—in einem harmonisch vereinfachten, stärker tonalen Stil mit einem deutlichen tonalen Zentrum auf D-Dur geschrieben. Seine Formen sind eher knapp: es findet weniger Verarbeitung des Materials statt, aber unter seinen Dur-Prätentionen fließt eine anhaltende dunklere Strömung, die für den früheren Roslawez typisch ist. Es scheint jedoch außerdem fast sicher, dass Roslawez im zweiten Konzert (wie im Scherzo der Kammersymphonie) usbekische oder zumindest zentralasiatische Volksmelodien anklingen lässt, ob als Zitat oder Imitation. Das Anfangsthema des ersten Satzes trägt diesen Charakter und wird (nach der Einfügung eines einer Figur in punktierte Rhythmus, die sich zur Verarbeitung eignet) praktisch in Technicolor gehandhabt, bevor das anfängliche Tutti abebbt. Der bemerkenswerte rezitativhafte erste Einsatz der Violine, begleitet von Paukenwirbel und Harfenglissando, setzt sich mit der zierreichen Dekoration eines zweiten Themas fort: dieses wird wiederholt und ausgedehnt und leitet in eine schnellere Durchführung über, in der die Violine sofort das Anfangsthema übernimmt, sich aber scheinbar damit zufrieden gibt, Fragmente in Flageolett und dekorativen Elementen zu spielen. Eines der faszinierenden Merkmale dieses Satzes ist sogar die verhältnismäßige Schlichtheit seines melodischen Materials, das der Komplexität und Bravour der Schreibweise für die Solovioline entgegengesetzt wird. Das wilde Rezitativ kehrt zurück, leitet diesmal aber in eine lebhafte vivo-Coda über. Der langsame Saz, Adagio, steht in verhältnismäßig simpler dreiteiliger Form. Er beginnt in F mit einer substantiellen Orchestereinleitung, in der ein anfängliches volkstümliches Thema bald zu nur einem einzelnen Faden in der Polyphonie des Orchesters wird. Dann übernimmt es die Violine, wieder in stark verzierter Form. Ein kontrastierendes Thema erscheint in a-Moll, im gleichen Tempo, das den Mittelteil bildet, und ein kurzes unbegleitetes Solo führt in eine weiter ausgeführte Fassung des Anfangsteils mit einer kurzen Coda, in der die Violine sich schließlich in die Höhe schwingt, um auf einem hohen F zu schließen. Die Stimmung ist durchweg elegisch und bedrückt, aber üppig harmonisiert. Das Finale, Allegro giocoso, beginnt mit einem fröhlichen Hauptthema, dessen Hautmotiv eine Dreiklangsidee von Zweitonfiguren ist, die in Terzen auf und ab hüpfen. Je mehr diese Figur zum Bass gravitiert, wechselt die Tonalität nach fis-moll, und die Violine singt von Harfe und Klarinetten begleitet ein langatmiges espressivo-Thema, das eng mit der volksliedhaften Melodie verwandt ist, mit dem das Konzert begann. Eine mysteriöse Überleitung führt zur überschwänglichen Idee zurück, mit der das Finale begann, wonach eine zweite Episode in Es sich mit einem weiteren volkstümlichen dolce-Thema entwickelt—in das das giocoso-Thema einbricht und alle in eine halsbrecherische Coda drängt. Obwohl sie brillant wirkungsvoll sind, scheinen sowohl dieses Finale als auch der langsame Satz eher verkümmert, als ob Roslawez unwillig war, das ganze expressive Potential seines Materials auszunutzen. Oder vielleicht beabsichtigte er einen Kommentar über eine Zeit, die Optimismus verlangte und keine Zeit zum Nachdenken hatte. Was auch immer der Grund, dieses Konzert bleibt ein ausgezeichnetes Vehikel für die Solovioline und hat die Vergessenheit, die bislang sein Schicksal war, gewiss nicht verdient.